The complete pellet plant can be applied in many places and areas. It can either be used by farms, small workshop, or large scale factories. The capacity of our biomass pellet plant can be turnkey made 0.2-20TPH. Till now, we have built complete pellet plants in many countries, including: Australia, Chile, Ghana, Israel, Italy, Malaysia, Morocco, Serbia, UK, Vietnam, etc. 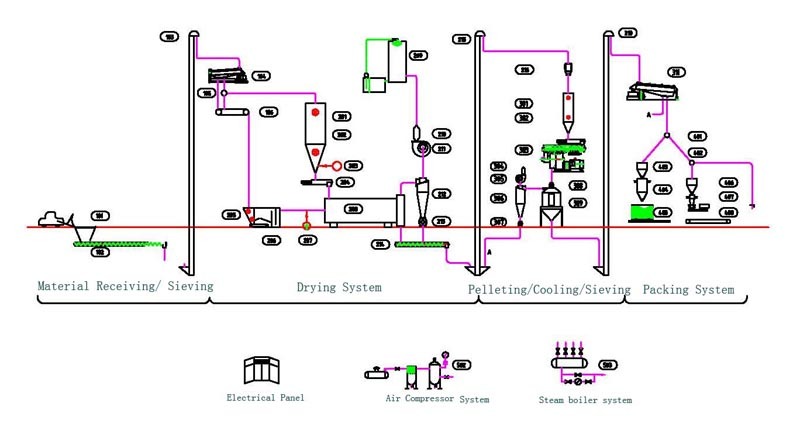 Usually, there are there models of complete pellet plant according to the production capacity. You can choose the most suitable one based on your requirements. Wood pellet line is the process of making waste materials into solid fuel. The objects are used for burning purposes. Wood Pellet is one of the most commonly used pelletizing materials. Groundnut-shell • Sugarcane Biogases • Caster Shells/Stalk • Saw dust • Coffee Husk • Paddy Straw • Sunflower Stalk • Cotton Stalks • Tobacco waste • Mustard Stalk • Jute waste • Bamboo Dust • Tea waste • Wheat Straw • Palm husk • Soybeans husk • Coir Pitch Barks/Straws • Rice Husks • Forestry wastes • Wood Chips and many other Agro wastes. The Moisture Content Should be Less than 12%, grain size is below 5*5mm. When the thickness of raw wood material is >10mm, and >50 * 50mm(L * W), we need use the Wood Chipper to chip them into small pieces, then crush the small pieces into wood powder with diameter less than 3mm by Hammer Mill (Crusher). The best moisture content to pelletize is about 13-15%. Our Rotary Dryer is made up of Stove and Main Rotary Dryer, which can reduce the moisture from 60% to 10%. Our stove is fueled by sawdust, wasted wood, coal, which can save electricity consumption largely. Our Rotary Dryer is specially designed for energy saving purpose, the outside of the dryer is covered with special cotton material sheet to prevent the heat from outrunning. The lubrication system for wood pellet lines adopt the tracing and inspecting system controlled by the microcomputer. When the temperature of the bearing is over the normal temperature, the microcomputer will start the Auto-Lubrication System to lubricate the bearings, which completely solve the trouble of lubricating roller depending on the operation experience. The Lubrication System is made up of the tracing and inspecting system controlled by the microcomputer, auto-lubricating system on time and compelled lubricating system by hand. Driving Gear adopts the high precision gear transmission structure. The wear bearing is SKF from Sweden. The ring die adopts the hoop fastening method, which is increasing the speed of discharge comparing with the past bolt fastening method. As a result, the capacity is 10-15% higher than the belt transmission structure. As per the wood pelletizing plant ring die and roller of the wood pellet line, we have the fine machining with the alloyed steel. And our heating treatment is also different from the other domestic manufacturers. Our carburizing treatment make the depth of hard facing to 2mm, which improve the anti-abrasion of the ring die and roller more than 10 times, and it can save the production cost heavily. After the pelletizing process, the temperature of the wood pellet is about 60-80 degree, and the moisture content of the wood pellet is about 15%, so we need use Cooler to reduce about 3-4% moisture, so that the wood pellet will be easy to store. But considering the feedback from some foreign clients, the local climate is very humidity; they hope to cool the wood pellet with moisture 7-8%. In order to satisfy the different need from different clients, we develop one kind of new Stabilizer Combined with Cooler. After cooling, the wood pellet will not directly enter into the fuel process to avoid the wood pellet effected by damp. The packing process is necessary. In this process, we assemble our domestic best Semi-Auto Packing Machine for you.Generally, most clients needs one small weight range scale with auto sealing packing machine, and one large weight range scale with semi-auto packing machine. For the first one, the weight range will be 15-25kgs per bag, and for large scale, it will be 1000kgs per bag or 800kgs per bag, up to different clients needs. Note:During the complete wood pellet line, the Dust Filtering is one heavy and important task. We assemble the Common Dust Collector(known as cyclon) and Impulse Dust Filter, for the exhausting air, we use Water Film Dust Collector to get to the free dust situation in the process of Drying and Cooling for which generate plenty of dust in the working time. AGICO is a main manufacturer of Wood Pelletizing Plant and Wood Pellet Producer in China, who have specialised in the design of Wood Pellet Line. We offer Wood Pellet Lines.High quality,best service.